Dog Friendly Perthshire is committed to ensuring that your privacy is protected. Should we ask you to provide certain information by which you can be identified when using this website, then you can be assured that it will only be used in accordance with this privacy statement. 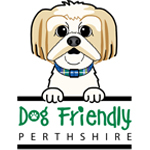 Dog Friendly Perthshire may change this policy from time to time by updating this page. You should check this page from time to time to ensure that you are happy with any changes. This policy is effective from 27th April 2018. Dog Friendly Perthshire is the trading name of Mrs Katie Jane McCandless-Thomas. other information relevant to customer surveys or offers. From time to time, we may also use your information to contact you for market research purposes. ∙ To respond to your questions and comments; to provide you with access to certain areas and features on the website; and to communicate with you about your activities on the website. ∙ To fulfill your requests. ∙ To investigate suspected fraud, harassment, physical threats, or other violations of any law, rule or regulation, the rules or policies of the website, or the rights of third parties; or to investigate any suspected conduct which we deem improper. ∙ To the extent that you provide us with financial information (such as credit card or bank account numbers) in connection with shopping or commercial services offered on the website, we may use the financial information that you provide to fulfil your order. ∙ To help us develop, deliver and improve our products, services, content and advertising. ∙ To share with our partners involved in creating, producing, delivering, or maintaining the website, as required to perform functions on our behalf in connection with the website (such as administration of the website, administration of promotions or other features on the website, marketing, data analysis, and customer services).In order to share such information, it may be necessary for us to transmit your information outside the European Union and you agree to this transfer. Further use or disclosure of information by these parties for other purposes is not permitted. ∙ To share with third party service providers whom we employ to perform functions on our behalf in connection with the website (such functions may include, but are not limited to, order fulfilment, delivering packages, sending postal mail and e-mail, removing repetitive information from customer lists, analysing data and providing marketing assistance, processing credit card payments, and providing customer service). These third party service providers have access to information that is needed to perform their functions, and may collect or store information as part of their performance of these functions, but are not authorised to use it for other purposes. ∙ For our internal purposes such as auditing, data analysis, and research to improve our products, services and customer communications. ∙ For other purposes as disclosed when your information is collected or in any additional terms and conditions applicable to a particular feature of the website. ∙ For disclosures required by law, regulation, or court order. ∙ For the purpose of or in connection with legal proceedings or necessary for establishing, defending, or exercising legal rights. ∙ In an emergency to protect the health or safety of users of the website or the general public, or in the interests of national security. Except as provided for herein, we will not provide any of your information to any third parties without your specific consent. We will not sell, distribute or lease your personal information to third parties unless we have your permission or are required by law so to do. We may use your personal information to send you promotional information about third parties which we think you may find interesting if you tell us that you wish this to happen. You may request details of personal information which we hold about you under The General Data Protection Regulation (GDPR) (EU 2016/679). If you would like a copy of the information held on you please write to Dog Friendly Perthshire, 8C James Street, Perth PH2 8LZ or e-mail info@dogfriendlyperthshire.co.uk.